This is quite easy, the main thing is to be careful with the Find and Replace expressions. 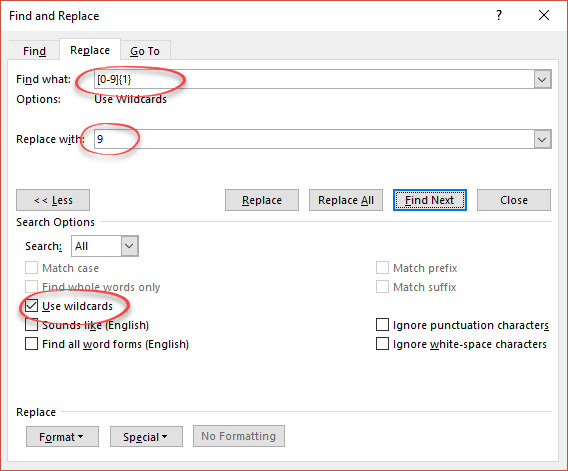 It will work with any version of Word that has the ‘wildcards’ / Regex option which means Word 2003 or later for Windows (maybe earlier) plus Word 2016 and 2011 for Mac. Make a copy of the document you want to randomize. 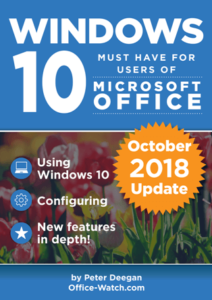 Open the original, then File | Save As to save to a new name. Make sure you’re working on the extra copy, not the original. Don’t laugh, it happens to the best of us. Go to the Replace dialog box. Press Ctrl + H is the fastest way or press Ctrl + F to open the Navigation pane then choose Replace from the pull-down menu. Use Wildcards – must be ON. This is vital. Search – All makes sure you search the whole document not just up/down from the current cursor location. Make sure there’s nothing else in the Options under the Find what: except ‘Use Wildcards’. The line under ‘Replace with’ should be empty. Enter the first find expression. Copy and paste into the Find What box. This searches for two letter words only. There are NO spaces before, within or after the find expression. Another important point because spaces will change what is searched for. The ‘Replace what:’ looks like this. We’ve used ‘be’ but you can use any word of the same length. It’s vital there’s no spaces between the \1 and \2 . No spaces before or after. Always test before letting Word go through the whole document. Happily, that’s easy because Word’s Replace is what us nerds call a non-modal dialog, meaning you can switch between the Replace dialog and the document just by clicking in each. Move the Word cursor to the very start of the document. This isn’t essential but it’s easier during testing. Test the Replace by clicking the Find Next button to change the first found word. This will move and select the first found word which will be shaded. Once you’re happy that the replace is working correctly, click ‘Replace All’. Double check the search scope is set to ‘All’. You’ve done it once, now do it again for each word length up to whatever is needed. Find what: Change the number in the curly brackets. Use any words you like, here’s some to get you started that should be accepted by Word’s English language dictionaries. I.e. no red squiggly lines. Randomizing the digits is easier, just replace all digits with a single digit like 9 or 0. This will leave all currency signs, thousand separators and decimals in place. It only takes one Replace command. No spaces before, after or inside the expression. It’s best to copy/paste the whole expression. Just the digit you want to use as filler, with no extra spaces. UNDO Ctrl + Z will reverse the replace commands, one at a time. The formatting may change a little because words take up different lengths. Letters vary in width so the letter ‘i’ take up less space than ‘w’. There’s no distinction between upper and lower case. Some more complex Regex might be able to parse out the first letter of a word, figure out if it was Upper case and ensure the replacement had the same case. But we’re trying to avoid that level of complexity. It will detect ‘words’ or names with a mix of letter and digits/symbols. Email addresses and domain names are randomized with the period/dots and @ symbol retained. Graphics, charts, SmartArt etc are NOT changed. If they have confidential information, you’ll have to alter them manually. Expect some red and blue squiggles to appear, that’s normal. Word will warn you about repeated words and ungrammatical phrases.